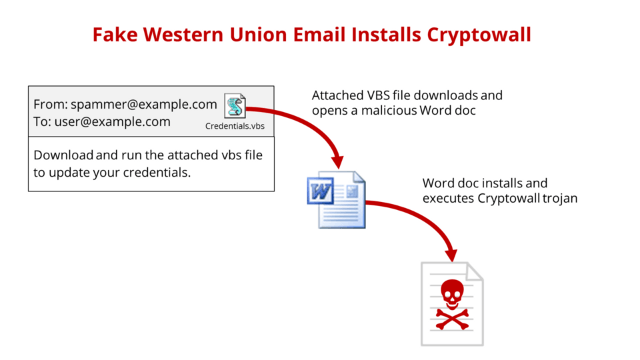 We're blocking a fake Western Union email spam campaign with a vbs (VB Script) attachment that installs the dangerous Cryptowall trojan malware. This email does NOT come from Western Union. In case one of these gets past your antispam or antivirus system, do not preview or open the email and do not download or run the attached vbs file. We already block vbs attachments for our customers, as should everyone, but we sometimes like to dig a little deeper to see if we can uncover additional useful information. One of our threat analysts was curious about an email with a particular vbs (VB Script) attachment. The email instructs the recipient to update their Western Union credentials by executing the attached vbs file. Not surprisingly, that's a bad idea. Doing so will install the Cryptowall trojan. VB Script is built into Windows and its use is widespread. Although recent versions of Outlook block vbs attachments from running by default, this one is easy to execute accidentally. Your antivirus system might not recognize the threat because the vbs file (the file you would most likely scan) does not directly point to or download Cryptowall. As of yesterday, only 6/56 antivirus vendors detected the vbs file as malicious and only 8/56 detected the doc file it downloads. This is an ongoing problem for traditional antivirus vendors They are less and less able to detect zero-day threats because they only scan the downloaded file. Cloud antispam analyzes the entire delivery mechanism and global traffic patterns for spammy behavior, which we have learned how to detect almost instantly.